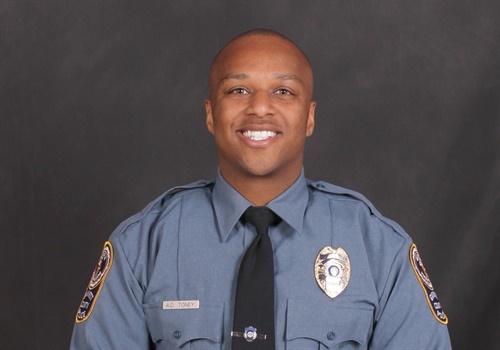 Officer Antwan Toney of the Gwinnett County Police Department was fatally shot on Saturday. Image courtesy of ODMP. Police in Georgia have arrested one suspect and have reportedly shot and killed another man in connection with the fatal shooting of 30-year-old officer Antwan Toney of the Gwinnett County Police Department on Saturday. Toney and another officer had been investigating reports of a suspicious vehicle. As the officers approached the vehicle at least one person inside began shooting. Officer Toney was struck as he and the other officer returned fire. The vehicle crashed a short distance away and its four occupants fled on foot. Police believe that 18-year-old Tafahree Maynard—who was reportedly fatally shot early on Monday—fired the shots that killed Officer Toney. A second suspect—19-year-old Isaiah Pretlow—was charged with aggravated assault related to a separate incident following Toney's fatal shooting, according to WBNS-TV. Officer Toney was transported to a nearby hospital where he succumbed to his wounds. Toney had been with the department since October 2015.